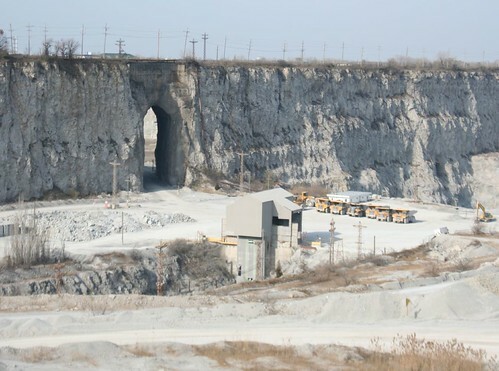 The fascination of a rock quarry isn’t hard to grasp. 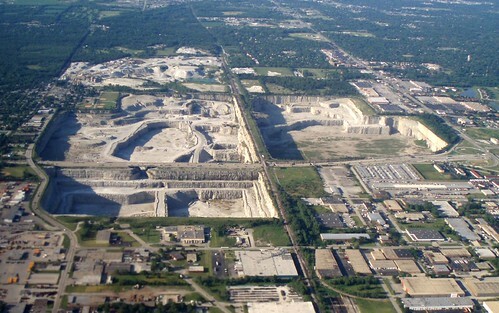 Here in the unendingly flat Midwest, a quarry is a shocking interruption of the landscape. The walls are vertical cliffs, their relief impressive in their own right and doubly so in the middle of so much prairie land. The artificial depths seem ominously unstable; despite the solid beds of rock that line their walls, it is hard to behold a quarry without feeling that somehow, Nature will strike back, bring the walls crumbling down, reclaim the pit, fill the vacuum. Land dikes separating quarry pits look precarious to begin with, even before they are pierced by Gothic arch-shaped openings to permit communication between pits. And water inevitably finds its way in, requiring constant pumping. The thought of water overwhelming the works of man is, I suspect, a primal fear on some level. Here it’s not just a shadowy thought, but frank reality. The quarry pit is a window into the Earth, showing us a slice of what lies buried under our feet. Rock strata that have not seen daylight in millions of years lay exposed to the world. Tunnels hint at darker depths still. The invasion of water gives one a visual grasp of the water table, the rivers moving below the earth’s surface. And finally, the sheer volume of material removed to create these pits beggars imagination. All this effort goes to remove minerals and rocks from the earth. A city the size of Chicago uses a lot of rocks. They doesn’t just go into those MidCentury buildings I’m so fond of; they’re cut and crushed and used as aggregate for concrete, gravel ballast for railroads, rip-rap for the lakefront, and many other purposes. 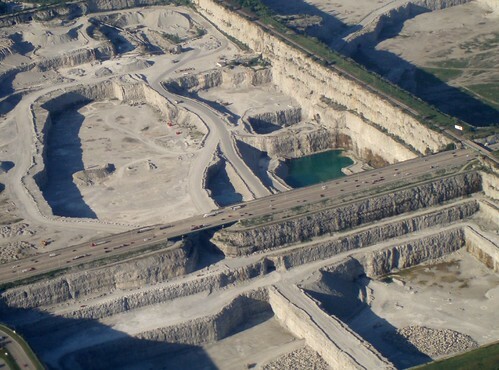 Being really heavy, rock is best harvested locally, and to that end there’s a surprising number of quarries to be found around Chicagoland. 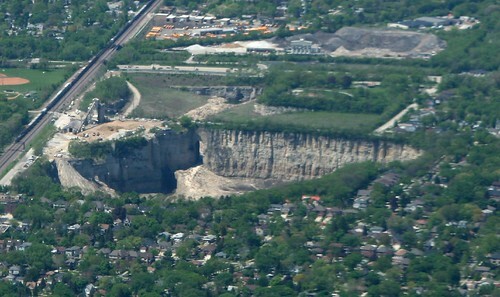 Thorton (the subject of all the above photographs) is the biggest and by far the most famous of Chicago’s rock quarries. The reason is obvious: not only is it huge, but it’s spanned by a massive and busy highway atop a two-hundred-foot high land dike. 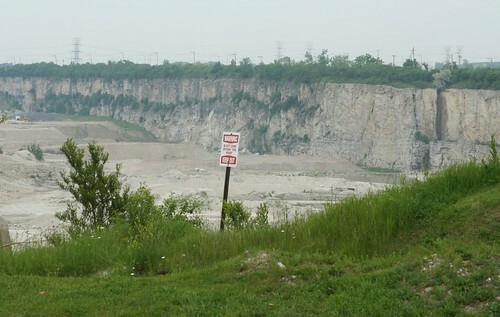 Views of Thornton Quarry are also easy to come by from the surrounding public roads. Access is limited by fencing, of course, but through the links one can see deep into the quarry’s depths. 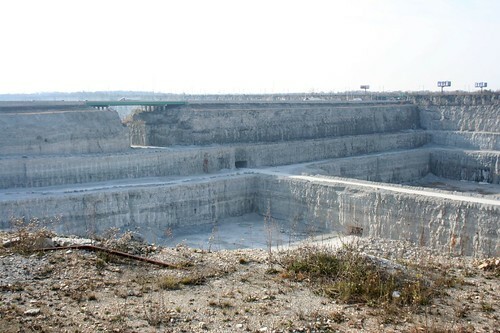 Thorton consists of four main pits, collectively forming one of the largest quarries in the world. Three of them are readily visible from the various roads hemming the site in. The material removed from here is for aggregates — the little bits of solid stuff that goes into concrete and various other materials. 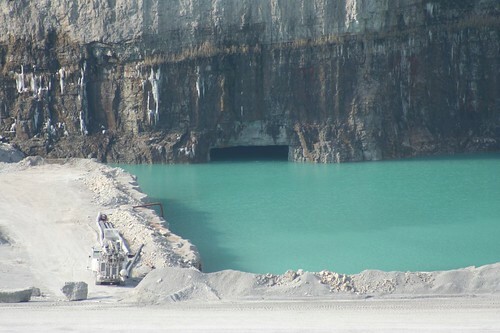 The northernmost pit, shown here, is being converted to a stormwater holding facility, for when strong storms overwhelm the city’s deep tunnel storage system. Tours of the facility are offered twice a year, and they fill up months in advance. 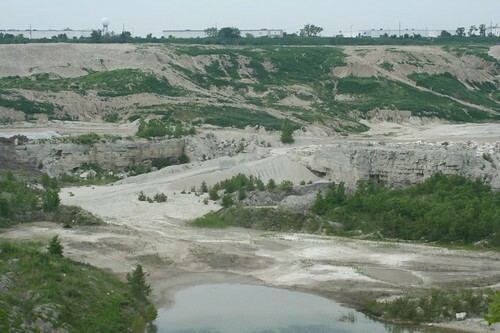 One of several pits operated in Chicagoland by Vulcan Materials Company, this pit operates beyond the city’s upper southwestern limits, covering some 650 acres. Sadly, very little of its depths are visible from public roads. Speaking of pubic roads, McCook’s operations have apparently destabilized one. 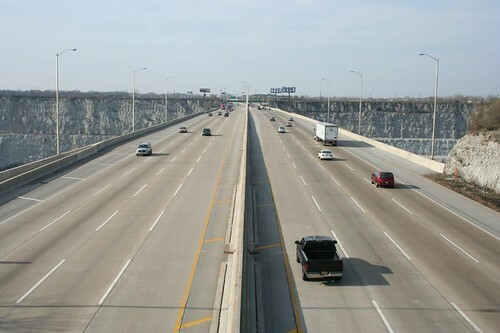 Joliet Road crosses the quarry on a land dike, similar to the Tri-State’s route across Thornton. 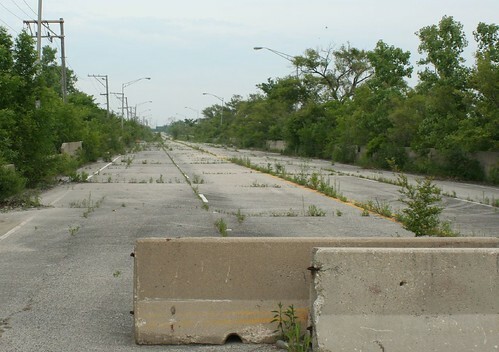 But the road has been closed since the 1990s, fenced, barricaded and overgrown with weeds. Somehow I missed this one on the ground, despite being only a mile away and on a very specific mission to visit quarries. I’ll get it some day! Like McCook, very little of this one is visible from public roads. This is about the best view one can get from outside the property, and you’d better be prepared to hoist your camera up high. 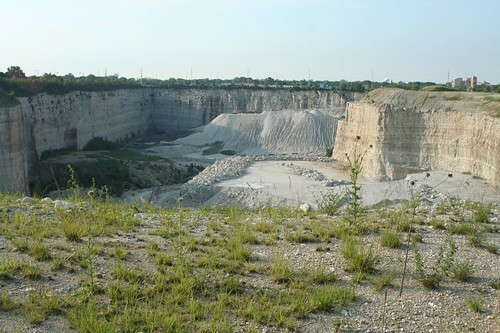 This former quarry now functions as a storm runoff holding facility for DuPage County. I’ve seen it from an airplane, but I have yet to visit on the ground. 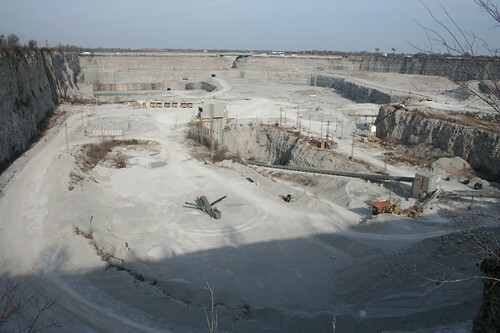 * Elmhurst Quarry Flood Control Facility, with live images! 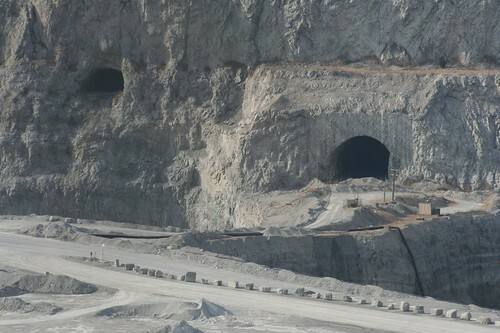 I think the several quarries are being used for Deep Tunnel storage around Countryside/LaGrange. 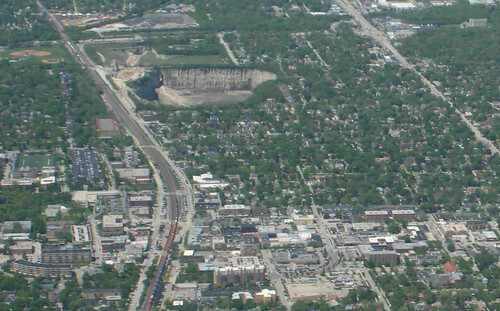 I remember the quarry that used to be off Halsted – it was always cool to see it. 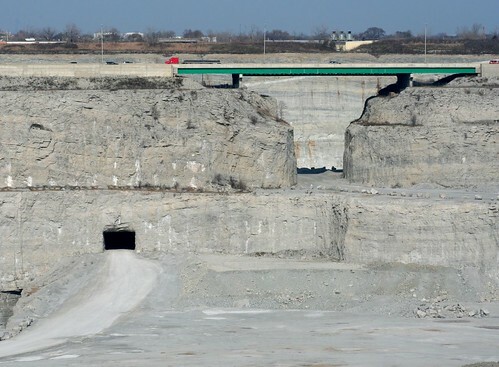 The quarry you list as unknown in LaGrange is actually in McCook as well. I live next to it. LaGrange is immediately to the west of it, and Brookfield just to the north.